(23139.G222, John Dunning Political Collection, OHS). THOMAS, JOHN WILLIAM ELMER (1876–1965). U.S. Rep. and U.S. Sen. John William Elmer Thomas ranks among Oklahoma's most important political leaders during the state's first four decades. Born to William and Elizabeth Thomas September 8, 1876, on a farm in Putnam County, Indiana, Elmer Thomas was seventh among seven boys and five girls. The young man found "general farm work was my lot, but not to my liking." Upon graduation from the one-room school at Brunerstown,the fifteen-year-old weighed 130 pounds and had passed six feet in height. Thomas's mother, a former teacher, encouraged him to pursue a pedagogical career, and while attending Central Normal College, Danville, Indiana, he taught at Happy Hollow, a one-room school. He graduated from Central in 1897. During the 1896 presidential contest twenty-year-old Thomas met and vigorously campaigned for William Jennings Bryan. Thomas recollected, "I thought I was able to explain the free silver 16-1 issue . . . to small town audiences." This experience led him to study law at De Pauw University, where he debated, edited the yearbook, and graduated in 1900. Thomas turned his attention toward Oklahoma after viewing a poster advertising a Rough Riders reunion in Oklahoma City. Visions of opportunity flashed through his mind, and he hastily decided to go west. Arriving on November 16, 1900, he at first taught English, received a license to practice law, went into business with Jay M. Jackson, a real estate agent. In summer 1901 Thomas moved his practice to Lawton. On September 24, 1902, he married Edith Smith. They had one child, Wilford Smith Thomas, in 1904. Water proved Lawton's scarcest commodity, and seeing a business opportunity, Thomas developed a partnership with Hal A. Lloyd of Altus. They opened Medicine Park Resort on Medicine Creek, near Mount Scott. The resort featured a dam that diverted water to Lawton, fifteen miles away. Thomas often hosted gatherings at the resort, earning him the sobriquet "the Sage of Medicine Park." Elected to the first Oklahoma Senate in 1907, Thomas achieved a number of successes. He served as president pro tempore from 1910 to 1913 and for ten years chaired the appropriations committee, a position responsible for funding the new State Capitol project. He also helped establish the state game and fish department and oversaw installation of the state's first fish hatchery, at Medicine Park. Although he won the Sixth District Democratic nomination for U.S. representative in 1920, he lost the November election. In 1922 he ran again and won. In Congress he served on the House Committee on Public Lands and Claims and maintained a keen interest in Indian Affairs and the farm problem. Between 1922 and 1926 he supported Indian education measures, the McNary-Haugen Farm Relief Bill, and legislation expanding farm credit. 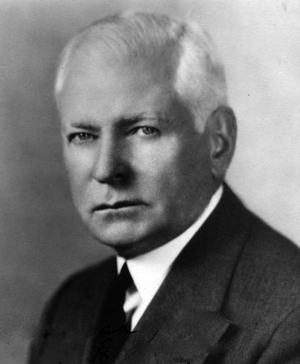 In 1926 he defeated former governor Jack Walton in the Democratic primary for U.S. senator, attacked the Coolidge administration for its insensitivity to farmers, and defeated Republican incumbent J. W. Harreld. In the Senate Thomas received assignment to the Committee on Agriculture and Forestry. During the Hoover administration he again supported McNary-Haugenism, as well as an export debenture bill, and he reluctantly backed Hoover's Agricultural Marketing Act in 1929. As the Great Depression intensified, he vainly advocated paying the soldier's bonus, liberalizing Federal Reserve policies, and currency expansion. Standing for reelection in 1932, he defeated Gomer Smith of Oklahoma City in the primary and Republican oilman Wirt Franklin of Ardmore. Hard times dominated Thomas's second term. The new crisis reminded him of the farm plight of the 1890s, and his solution remained the same—inflation and bimetallism. Proclaiming "We've got a surplus of everything but money," the Oklahoman gained leadership of a growing number of inflationists. An enthusiastic New Dealer, he crafted an ingenious legislative proposal became known as the Thomas Amendment to the Agricultural Adjustment Act of May 1933. The amendment combined four major inflation suggestions into one omnibus measure and granted the president permissive powers to use none, one, or any combination of inflation techniques. After meeting with Thomas the president accepted the amendment, and it became part of the "One Hundred Days" legacy of the Roosevelt administration. Thomas's New Deal credentials and his state boosterism transformed dust into lakes, brought about a host of public works projects, and secured the location of Tinker Air Force Base in Oklahoma. When Roosevelt visited in 1938, he urged voters to reelect him, and Thomas easily defeated Republican Harvey O. Glasser in November. Thomas, who knew Quanah Parker and had witnessed Geronimo's Christian baptism at Medicine Park, considered himself a friend to American Indians. He chaired the Committee on Indian Affairs between 1935 and 1944. Thomas maintained a keen interest in European geopolitics. A supporter of the League of Nations, the World Court, and the Kellogg-Briand Peace Pact in 1927 and 1928, he visited Paris as a delegate to the Inter-Parliamentary Union and made side trips to Moscow and Berlin. He voted for neutrality legislation in 1935 and 1937 but proclaimed military preparedness his main concern. In 1923 he had been commissioned lieutenant colonel in the U.S. Army, and he served in military intelligence. He retained that rank in the Reserves. In June 1938 he became chair of the Sub-Committee on Military Appropriations, and after inspecting numerous bases found the country's defenses "in critical condition." During World War II his subcommittee secured funding for the top-secret atomic bomb project. In the 1944 election he defeated Republican William J. Otjen. By the late 1940s Thomas ranked third in Senate seniority and chaired the Committee on Agriculture and Forestry from 1944 to 1946 and 1949 to 1950. He represented the Agriculture Committee at food conferences in Quebec and Copenhagen in 1945 and 1946, witnessed the Nuremberg War Trials, and in 1949 toured fourteen European capitals to audit Marshall Plan funds. In the 1950 primary septuagenarian Thomas contested the youthful A. S. "Mike" Monroney. Thomas's position favoring the private power companies over the rural electric cooperatives and farmers may have cost him the race. He lost by 14,653 votes. Leaving the Senate, Thomas opened a law office in Washington, served as a delegate to the 1952 Democratic national convention, and in 1953 spoke at the dedication of the new dam at Lake Tenkiller. "The Sage of Medicine Park" retired to Lawton in 1957 and died there September 19, 1965. Eric Manheimer, "The Public Career of Elmer Thomas" (Ph.D. diss., University of Oklahoma, 1952). Elmer Thomas Papers, Congressional Archives, Carl Albert Congressional Research and Studies Center, University of Oklahoma, Norman. Elmer Thomas, "40 Years a Legislator [Manuscript, 1954]," Congressional Archives, Carl Albert Congressional Research and Studies Center, University of Oklahoma, Norman. David Webb, "The Thomas Amendment: A Rural Oklahoma Response to the Great Depression," in Rural Oklahoma, ed. Donald E. Green (Oklahoma City: Oklahoma Historical Society, 1977). David D. Webb, "Thomas, John William Elmer," The Encyclopedia of Oklahoma History and Culture, https://www.okhistory.org/publications/enc/entry.php?entry=TH008.